The Smart Wall is an essential part of the Smart Enclosure and represents a return to fundamental principles of building science. We leverage the basics of natural principles with highly selective technological innovation and manufacturing – working in harmony with nature, not in opposition. The Smart Wall system is made of efficient, resilient and sustainable products, including HAVELOCK WOOL sheep’s wool insulation, Pro Clima membranes such as INTELLO Plus, and GUTEX exterior insulation board – resulting in buildings that are better for people and for the planet. So what are key attributes of the Smart Wall assembly? Natural Insulation Materials. Continuous GUTEX Wood fiberboard insulation and HAVELOCK WOOL sheep's wool cavity insulation insulation are non-toxic, zero-VOC high-performance materials. Vapor Intelligence. Pro Clima INTELLO Plus is a zero-VOC, vapor intelligent membrane that builds drying reserves by responding to changing conditions of vapor drive and moisture concentrations - and ensuring the long-term health of your building by preventing moisture loading of the building assembly. Airtightness. An airtight enclosure is essential - providing comfort, energy efficiency and protection against moisture damage - to high performance building. Pro Clima membranes and tapes provide long-term building airtightness. Comfort and Indoor Air Quality. A vapor-intelligent, airtight assembly that utilizes natural materials can guarantee a high level of indoor air quality and occupant comfort. The Smart Wall resists mold growth, eliminates concerns about off-gassing and VOCs, and is very effective at sound attenuation - all contributing to a healthy and comfortable indoor environment. Furring strips forming a service cavity (with optional additional sheeps' wool insulation) - for wiring, outlets and other services. Furring strips for back-vented rainscreen. The Smart Wall is the ideal solution for low-carbon, high-performance wall construction. Let's break it down further. Havelock Wool is a safe, all-natural insulation material. It is also baby-tested and approved. Moisture Control. Wool insulation is capable of absorbing up to 35% of its weight in moisture, and manages moisture levels against 65% relative humidity. Toxin Sequestration. Wool binds permanently to formadehyde, sulfur dioxide, and nitrogen oxides, sequestering them from the air that you breathe and improving the health of the indoor environment. Chemical free. No dyes, toxins, or other chemicals are added to this virgin, untreated wool product. Fire Resistance. Wool extinguishes after smoldering, limiting the spread of fire. This is in great contrast to the high flammability of petrochemical-based insulation materials. Easy Installation. Wool is available in batts, or can be blown-in behind the interior air membrane like cellulose insulation. Long-lasting Performance. Wool resists mold growth, and won't sag over time, meaning that your R-values and healthy indoor air quality will be maintained over the life of the wall assembly. Zero-waste. Wool can be reused or composted after use, mitigating concerns about the life-cycle impacts of building materials. Havelock Wool comes in batt or loose-fill (not dense-pack). Wool is naturally a straight fiber, able to hold its form without settling. The wool targets 0.5 lbs/ft3 whereas cellulose dense-packed would be 3.5 - 4 lbs/ft3. Wool is a safe, comfortable, and natural alternative to synthetic insulation. So give your house the sweater it deserves with Havelock Wool. Vapor open and weather-resistant. At 44 perms, GUTEX wood fiber boards are highly vapor-open, allowing outward drying and preventing moisture build-up in your wall assembly. Noise attenuation. GUTEX is dense, and provides additional noise attenuation to ensure occupant comfort. High thermal lag. Because of its density and high specific heat capacity, GUTEX boards heat up slowly. This keeps the building cool on hot days, and comfortable at night. Net carbon sink. GUTEX is made from post-industrial recycled wood chips mixed with shavings of spruce and pine. Because trees take carbon from the atmosphere, GUTEX is a carbon-negative product. Low impact dry production process. The unique dry-production process for GUTEX increases the density (and therefore performance) of the boards while reducing the energy required for their construction. Environmentally friendly disposal. GUTEX can be re-used at the end of their life in your building, can be burned as fuel, or, because they are biodegradable, will easily break down. GUTEX wood fiber board serves numerous roles in your building assembly and ensures long-term building performance. Pro Clima membranes are the lynchpin of our approach to airtightness. 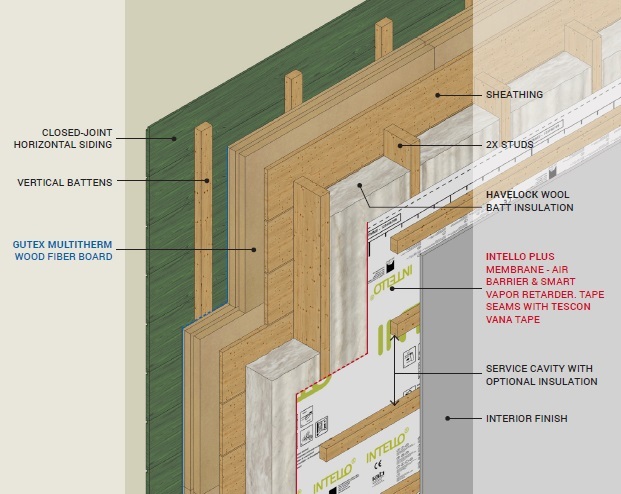 INTELLO Plus, our recommended interior membrane, ensures long-term airtightness and vapor intelligence. This vapor-variable membrane is responsive to interior relative humidity levels to ensure that moisture is able to leave the assembly. As Alex Wilson has written on BuildingGreen, "Smart Vapor Retarders: Not Just Your Grandmother's Poly". Truly airtight with a tested airtightness of 0.00005cfm/ft2 per ASTM E2178. The strongest and most intelligent vapor curve. Providing unsurpassed protection against moisture damages. Durable: able to take a beating on the job site. Complete system: of gaskets and connecting components such as tapes, caulks - tested to perform best. Fully integrated with other components: like window penetrations and pipe penetrations. Declare Label recognized by the International Living Future Institute. Pro Clima membranes (and the tapes that complement them) are the best way to ensure permanent building airtightness without risking the accumulation of moisture that can lead to the growth of mold and rotting structural elements. We believe the Smart Wall, consisting of Pro Clima membranes, Havelock Wool insulation, and Gutex wood fiber board, exemplifies what is possible. A sustainable future means re-balancing our respect for natural processes and our technological innovations. So, make the Smart Wall choice. Contact us to get started today.